Existing data shows that Child Access Prevention laws, where they exist, help prevent unintentional shootings and youth suicides. Storage laws correlate with decreased accidental child gun deaths and decreased suicide rates. The vast majority of existing research found decreases in child mortality and suicide (especially youth suicide) as a result of these laws. Research found that accidental shooting deaths of children decreased by 23% following passage of Safe Storage laws. Total youth suicides (not just youth suicides by firearm) were reduced by 8.4% with the implementation of a storage law. Firearm storage laws aim to regulate how firearms are kept within the home. The laws often require that that firearms be locked away, unloaded, or fitted with a trigger lock mechanism. There are four states that have enacted laws that require safe firearm storage. 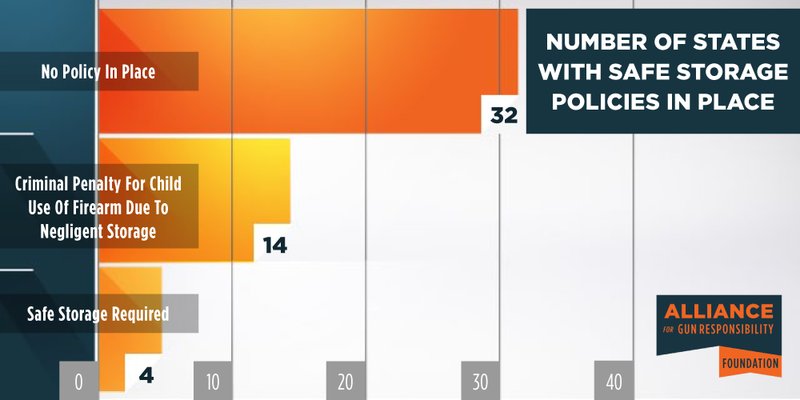 14 states have policies in place –Child Access Protection laws — that penalize the gun owner if their firearm is used or accessed by a child as a result of unsafe storage. The remaining 32 states, including Washington, have no storage requirement or Child Access Prevention law in place. Existing literature provides evidence that Safe Storage Laws, both in the form of an explicit requirement of firearm storage, and a criminal penalty for child access as a result of negligent storage decrease youth suicide rates and reduce the frequency of accidental child deaths. The existing literature does not provide evidence of the same effect in the adult population. Although one study evaluated the effect of Safe Storage Laws on suicide rates for all age groups, their findings of a comparison between states do not indicate a causal relationship between these laws and total suicide rates. However, the study found that in the four states with explicit safe storage laws, only 38% of suicides were committed by firearm, as opposed to 52% in states that did not have these laws. Further research is needed to draw conclusions from this difference, but this may indicate that these laws alter suicide behavior. Because firearms are the most lethal form of suicide attempt, a policy that reduces usage of firearms in suicide attempts may contribute to lower total suicide rates. Anestis, M., Anestis, J. (2015) Suicide Rates and State Laws Regulating Access and Exposure to Handguns. American Journal of Public Health. 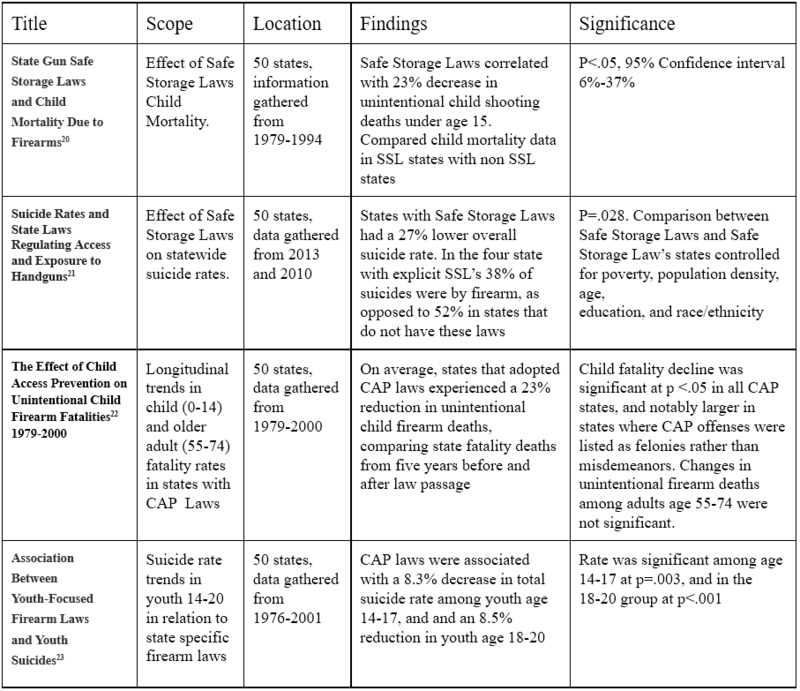 Cummings, P., Grossman, D. (1997) State Gun Safe Storage Laws and Child Mortality Due to Firearm. The Journal of the American Medical Association. Grossman, D., Reay, D., Baker, S. (1999) Self-inflicted and Unintentional Firearm Injuries Among Children and Adolescents. Arch Pediatric Adolescent Medicine. Hepburn, L., Azrael, D., Miller, M. (2006) The Effect of Child Access Prevention Laws on Unintentional Child Firearm Fatalities. The Journal of Trauma 1979-2000. Webster, D., Vernick, J., Zeoli, A., Manganello, J. (2004) Association Between Youth-Focused Firearm Laws and Youth Suicides. The Journal of the American Medical Association. Thank you to the survivors who bravely shared their stories. Your voices in this movement are critical.